When creating something—whether writing, sketching, jotting lyrics, or laying out a plan for a new project—getting started is often half the battle. To feel the freedom simply to begin—to make a first draft—makes the work possible. Any writing teacher or art instructor will tell you that good creative work begins not with a finished product, but with a draft. That may seem obvious, but lots of folks involved in creative pursuits forget that the first goal of putting something down to paper should be, well, to put something down to paper. It need not be a finished product; in fact, in all but the rarest bursts of inspiration, it’s the working over the initial insight or burst of effort that leads to a refined or compelling outcome. As Ernest Hemingway put it, in a dictum variously attributed to others, “Easy writing makes hard reading.” It’s the constant, if not obsessive commitment to drafting and revising and redrafting that leads to strong work. 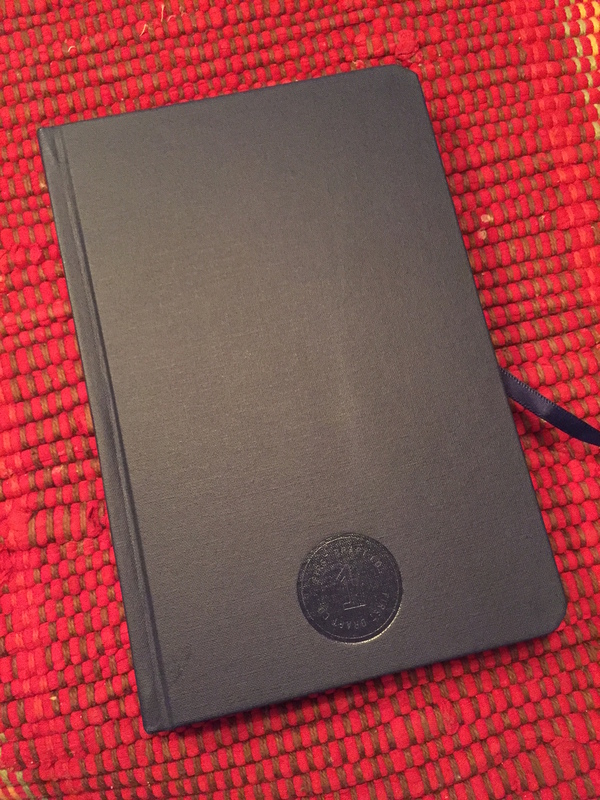 That’s one reason I like the name of the company that produces this journal, which suggests that what happens in the pages of its product will be a starting place, a beginning. “We started First Draft Co. with a passion to build tools and experiences that inspire creativity,” the web site announces. The blank book provided for this review looks impressive from first glance. But it also has a solid feel. The hardcover boards, covered with library buckram, give heft, and make the book feel like more than a sketchpad or casual notebook. The satiny place ribbon also conveys something classy and useful, making it easy to resume work once the journal has been put away. The pages are blank—no lines or dots—leaving the creator ultimate freedom. 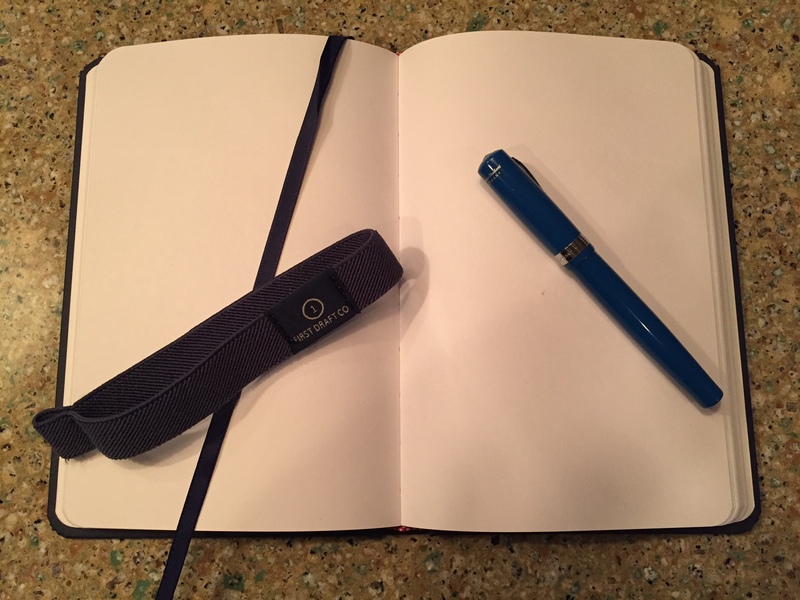 The elastic cloth band holds the pages and cover together. Slipping it off takes a couple of seconds but that need to perform a ritual act allows for a moment or two or reflection, allowing a pause for gathering one’s thoughts, perhaps one’s scattered presence for the promising task at hand. 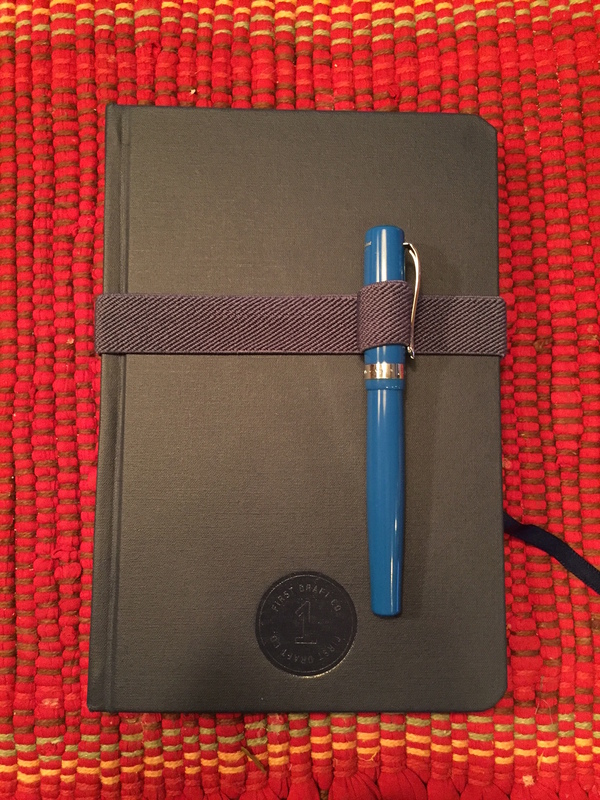 You can find the First Draft Co. notebook (together with the Blackwing pencils and gorgeous desk gear they offer) here. Thanks to the kind folks at First Draft Co. for the notebook for review, provided without any expectation as to the content of this write-up. Next Post Accordance 12 is Coming….